In my book this is the perfect Thanksgiving BBQ Turkey Recipe especially if you are the enthusiastic owner of a kamado style barbecue. 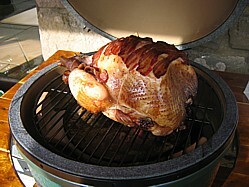 It's certainly well worth having a go at this one... I’ve chosen maple wood chips for the smoke. I cook my turkey on a Monolith kamado so I’ve written this recipe generically for the kamado style BBQ but provided you’ve got the facility to create in indirect heat set up in your barbecue and maintain a good temperature then you can still follow this recipe. The only other thing that you really need is a thermometer so that you can check the temperature of the bird. The cooking temperature for my Thanksgiving BBQ turkey recipe is exactly as you would cook in the oven so that the Maillard reaction takes place and you end up with a lovely brown crisp skin. I also think it crucial that when giving thanks we also respect the animal that has died for our celebration so it's important to ensure that before slaughter you turkey had the bast and longest life possible. So in my book the only way to truly deliver the best Thanksgiving meal is if you choose either a wild or organic turkey. It's only once a year so make that extra effort. The first thing to do is to rub the Turkey all over with your favourite barbecue rub, I'm not going to be prescriptive but this is the one that I like to use. There are no allergens in this rub although do note that some spice distributors add a little flour to their spices to act as an anti caking agent. If flour has been added then gluten will be present in the rub. Yay! My Thanksgiving BBQ turkey recipe contains no allergens. Taking care not to tear the skin, slide your hand between the breast and the skin of the turkey to separate the skin. Apply a gentle sprinkling of the rub under the skin and all over the exterior of the bird, that way you'll get flavour into both the breast meat and the crispy skin. When done you're ready to cook so load the bird onto a roasting rack and place the drip tray underneath. In the drip tray place the white wine and the other vegetables. Set your kamado up for indirect cooking by placing the heat deflector stones between the fire and the cooking chamber not forgetting to add you wood chips prior to putting the heat deflector stones in situ. Note: If you have a smoke chip feeder system on your kamado then you can add wood chips whenever you want. Stabilize the cooking temperature at 170°C or 350°F and smoke the Turkey over the maple wood chips for approximately 12 minutes per pound. Use a temperature probe to check the temperature of the bird in both the breast and the thigh, you need a reading of 75°C or 165°F. Now let your turkey rest for a couple of hours. This is a vital step to ensure that you maintain the succulence of the meat, carve too early and you'll find juices running out of the bird and rapidly filling the well of your carving board. The resting time will allow the juices inside the bird to cool and solidify in the meat, for sure your meat will be cooler too but hot plates and hot gravy will sort that out for you. Use the contents of the drip tray to make the gravy, squash the vegetables though a sieve with the back of a spoon for added sweetness and flavour. Serve your turkey on hot plates with piping hot gravy and ENJOY YOUR THANKSGIVING BBQ TURKEY!